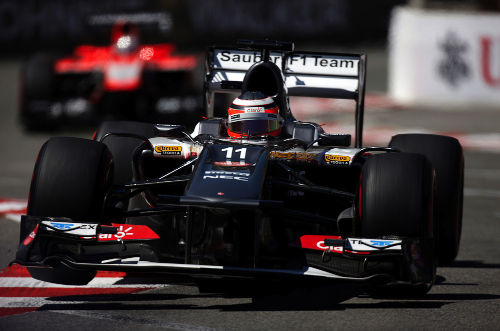 Sauber has allayed fears a financial crisis could see the Swiss team exit formula one before the 2013 season is out. A constant presence in F1 since 1993, the Hinwil based squad lost its works BMW backing at the end of 2009 and ever since has been among the sport's struggling privateers. This year, Sauber unveiled an uncompetitive Ferrari-powered C32, but promised to develop and improve it. "For financial reasons, development of the car has stopped," revealed authoritative Swiss correspondent for the Blick newspaper, Roger Benoit. There are rumours bills are going unpaid, and chief designer Matt Morris has already fled to McLaren. Told by Benoit that in February she promised the C32 would look very different by mid-season, team boss Monisha Kaltenborn revealed the reason for the lack of development. "We have been in negotiation for some time with a potential partner," she said. "The whole thing is taking more time than we thought it would, but we are on track." It is rumoured that potential partner is Gazprom, the Russian natural gas giant that was a Minardi sponsor some years ago. Gazprom recently became a sponsor of Sauber's English football club partner, Chelsea. Asked by Benoit if she can guarantee Sauber will still be on the grid come the season finale in November, Kaltenborn answered: "We have been asked that question since 2010. "We are currently going through a difficult phase, but we will continue in 2013 to the end."